Halfway into Chinua Achebe’s There was a Country, just after clinical school had gratefully allowed me a little time to read the book page after page, I get to hear that Achebe is no more. The elderly gentleman (or rather his chi) wouldn’t even allow me a few more days to finish his book and put up a few more informed lines (I had earlier written a few lines on October 9 last year after reading Chimamanda’s review of the same book) on my own opinion. So, it happened that I sat to table to finish the book in less than a day, simply to be able to pen a proper tribute. I am not in any way tutored in literary critiques, but then we tend to learn many things that we aren’t taught really. My appreciation of Achebe’s stance is all the more robust now. I saw a man who was saying what he saw, whether you thought he was right or wrong. He is a gifted storyteller, a genius of sorts. He uses words he chooses, digresses without remorse and often repeats himself maybe for fear that the reader wouldn’t recall what he earlier said. There was a Country is called A Personal History of Biafra. It truly is: His sentiments, his words, his conclusions and at times his allusions are considerably personal. He frequently uses words like ‘I think’, ‘I believe’, ‘in my opinion’. Far from being simply a purely academic work in a sense, he prefers to write in an intrinsically personal way, at one time or the other sprinkled with expected personal ‘prejudice’. For him and for all those who lived through the war, it is entirely personal. Nearly every family in Igboland has a bitter experience of the war and it would be callous to expect these people not to tell their stories, however personal they paint it. One reviewer asks Achebe to provide his evidence when he alludes to ‘organized genocide’ against the Igbos. But you know, some things are simply so glaring that they need no protocol to be accepted. You do not ask a woman who just delivered a baby in your presence to provide ‘evidence’ that she really owns the baby. Till this day, unbridled violence against mainly the Igbos is still commonplace, especially in the North. Our parents and contemporaries of Achebe speak of those times as a time of tremendous trepidation when “sleeplessness was endemic”, when there was “agony everywhere”, when the dead bodies of our people and children starved to death littered the roads, when the plan was to destroy every moveable thing in Biafran territory. Such horrors can only be imagined by the younger generation. But Achebe invoked in me something deeper than a spirited appreciation of the bitter sentiments of the war. He wrote of the pride of a suppressed man. To say the least, this last work of his has printed in us a sort of ‘positive bitterness’; the kind of ill-feeling that makes you work harder. He invites us to commit to a cause, a just cause rather than to complacently yield to the tendency to retreat in the face of our lives’ realities as Igbos. It is this kind of retreat that risks impoverishing our destiny, stunting it, and shrinking it. Such destiny would be almost irretrievable. 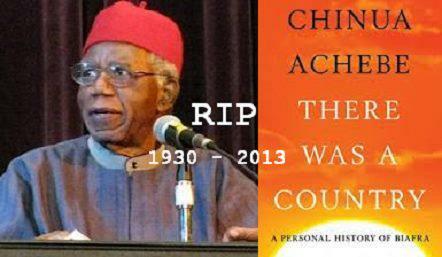 I do not mourn Achebe’s death. I mourn what died in him, which is the bigger tragedy. What is so prominently evident that it cannot be annulled is that such experienced forthright voices are dwindling in Igboland. This last book of his raises questions, deep questions on values that we the younger generation need to keep in mind as we move on. He said everything he wanted to say; to think that he kept anything back would be a conjectural leap. In some way, I believe he is speaking to me and my contemporaries. The idea of a secessionist Biafra may now be a remote thought but the values that led to our grandfathers and relatives dying in millions over forty years ago are ever present in our minds. There is a struggle for our survival that we carry on not necessarily with demands of sovereignty; it is a struggle in our minds. I came to the conclusion that like the motto of his alma mater, he dreams that the Igbo nation will again shine as one and jettison a culture in which everyone is his own criterion. Things do not, perhaps, have to fall apart even when he is gone. He died a man of goodwill, he was a man of the people, and he died at his post. 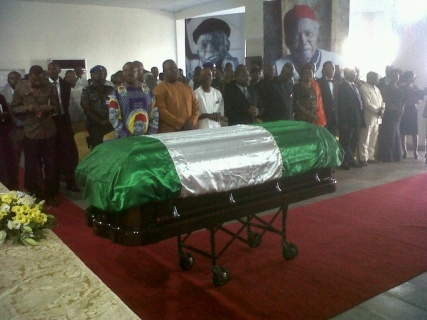 Remain rested Achebe, only men of goodwill truly rest in peace.